Charter Revision commissioner Carl Weisbrod has said the city is unlikely to gut its land use review process when it votes later this year. But he warned tweaking the process could be just as harmful to the real estate industry. “Dramatic change to our system of as-of-right development is, in my view, unlikely to happen,” Weisbrod said. “That said, there are number of proposals on the table with respect to land use that are being seriously considered that will have a significant effect. Weisbrod was speaking during a special presentation by New York Law School featuring REBNY’s vice president Basha Gerhards, Met Council CEO and former City Councilmember David Greenfield, Trinity Place Holdings executive vice president Miriam Harris, former chair of Manhattan’s Community Board 1 Catherine McVay Hughes and Weisbrod, who is a commissioner on the Charter Revision Commission 2019. The Uniformed Land Use Review Process, or ULURP, is among a plethora of government processes and products included in the charter that is currently under review, including how the city spends its money, how zoning and land use impact neighborhoods and other major procedures. A March commission meeting focused on land use and planning discussed how the ULURP should focus on community involvement and transparency but also agreed that it currently works well. Recommendations to change the charter include adding 30 extra days for a community board’s review as part of the ULURP, overhaul of the city’s environmental review process and whether city planning as a whole should be considered neighborhood-by-neighborhood or on a citywide basis. While many commissioners expressed their desire not to significantly alter the ULURP, sometimes a community is left unheard. According to McVay Hughes, Community Board 1 is still waiting for community center that was promised with a project that underwent ULURP. While Gerhards agreed that ULURP isn’t without its faults, a major revamp of the process might not be the solution. And even with the heated opinions that come with a ULURP, Weisbrod added that a contentious land use process is a sign of a healthy city. “I am not aware of any city that doesn’t have a highly contentious land use process because this is one of the key issues that municipal government is engaged in and that’s particularly true in cities that are dynamic and growing,” Weisbrod said. Representing developers, Harris agreed with Weisbrod that ULURP was a sign of a healthy city. Miriam added that with other municipalities, projects can be postponed indefinitely, with the possibility of legal action being the only way forward. Greenfield said that there was a lot of noise coming from the pro-development versus anti-development debate, but wanted the commission to focus on improving the ULURP methodology. 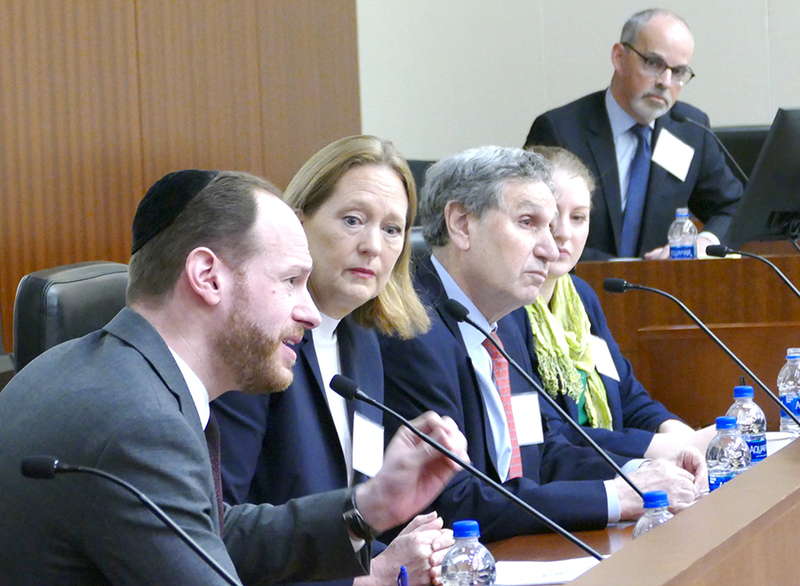 Photo top: NY Law School hosted a Charter Revision debate that included l-r: David Greenfield, Catherine McVay, Carl Weisbrod and Basha Gerhards.